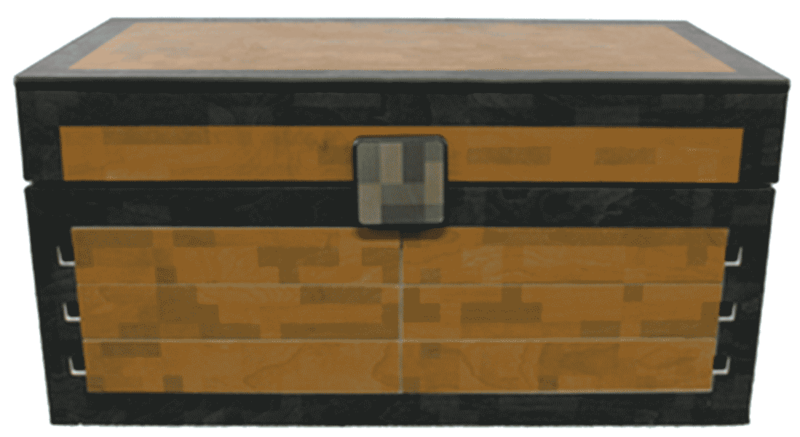 Below are the most common questions we get asked about the Maker’s Chest. If you have a question that we haven’t answered here please ask us from our Contact us page. What is the size and weight of the Maker’s Chest? The dimensions are 36” Wide x 18” Tall x 18” Deep. The weight is 65lbs. How durable is the Maker’s Chest? The Makers Chest is built with a precision tongue and groove system. It is press fit glued and pocket screwed. The material used is extremely resilient, and is NOT cheap laminated particle board or fiber board. The Maker’s Chest is made with high end furniture materials and designed to last for decades. Does the Maker’s Chest come preassembled? Yes, it arrives pre-assembled but you will have to attach the hinges, the magnetic latch, and the compression lifters when you open the box (takes 5 minutes or less). If you purchased a Figure Showcase with your Maker’s Chest, there is some assembly required. No, the hinges are made of powder-coated aluminum. They are designed to hold hundreds of pounds of force. Be cautious if opening the lid without the lifters attached to it. The lid will fully open and may cause damage to the wood. How do I clean the Maker’s Chest? You can clean the Maker’s Chest the same way you clean any piece of furniture, by simply dusting or wiping it off with a clean dry cloth. For added beauty and protection try using a furniture oil or spray to really make the graphics and grain POP! Does the Figure Display come preassembled? The figure display requires assembly to complete. We designed the figure display to be a small and fun project to put together with your young Maker. Everything fits nicely into place and easy to follow instructions are included as well as a link to video instructions. It takes approximately thirty minutes to build (less if not installing the mini-figure bases). You will need a hammer and a screwdriver. It might also be helpful to have a rubber mallet, but it is not required. Wall mounting hardware is included. If you opt to have the display bases included you will need a hot glue gun to secure the pieces to the floor of each figure compartment. Recommended build age for the Figure Showcase is Ages 8+. Adult supervision is required. 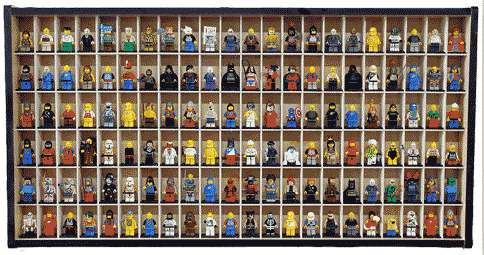 What size mini-figures fit into the Figure Display? The space for the mini-figures is 1.3” wide x 2.5” tall x 1.5” deep. Remember that the mini-figures are not included. Can I purchase the figure bricks alone? Yes, they are available separately, however it is usually a better deal to buy them with the Figure Display. Does the Figure Display include any mini-figures? No, the Figure Display does not include any mini-figures. Absolutely! Please review our full Warranty here. We have a 14-day “love it or leave it” refund policy on all pre-orders. If you decide to cancel your order for any reason prior to shipping, we will refund your full payment. If you have received your Maker’s Chest, you have 14-days to contact us and return it safely back to us in order to receive a full refund. Please safely pack it back in the original packaging and contact our customer service team here. All returns require a Return Authorization from us before being shipped back. The cost of return shipping is not covered by the seller. Customers within the USA will receive automated shipping updates from UPS, FedEx, or the selected courier service for your Maker’s Chest shipment. You can track your shipment to your door through the courier’s tracking system on their dedicated website by copying and pasting the tracking information there, or you can simply click the tracking number in your email and it will redirect you to the most up-to-date information for your shipment. What do I do if I miss my delivery date? If you have missed a delivery attempt from the courier, a note will be left with information regarding scheduling a new delivery date. Re-delivery will be attempted the following business day unless new arrangements are made. If you do not contact the courier and they make multiple unsuccessful delivery attempts, your order will be returned to our warehouse in Ohio. Who do I contact with a Warranty question? You can contact our Customer Service team with any warranty questions here. How does my Maker's Chest ship? Maker’s Chests ship via standard ground delivery from a selected courier such as UPS or FedEx.